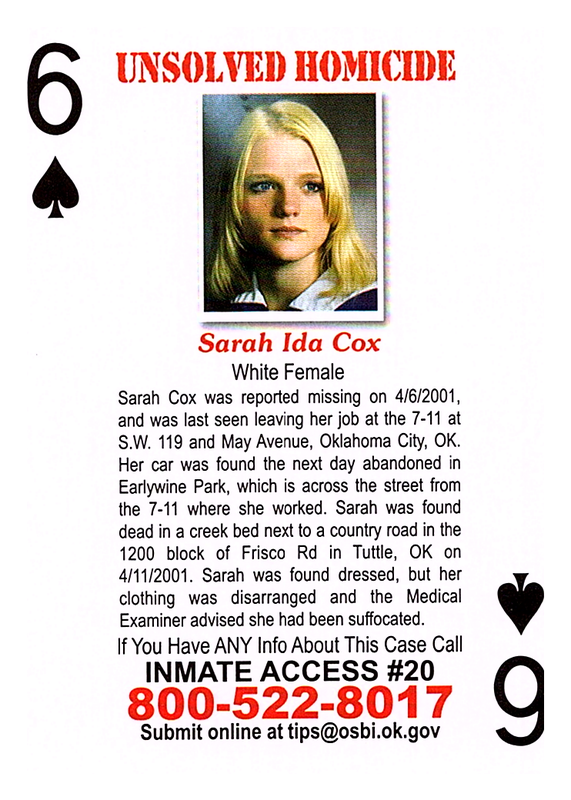 Sarah Cox was reported missing on 4/6/2001 and was last seen leaving her job at the 7-11 at S.W. 119 and May Avenue, Oklahoma City, OK. Her car was found the next day abandoned in Earlywine Park, which is across the street from the 7-11 where she worked. Sarah was found dead in a creek bed next to a country road in the 1200 block of Frisco Rd in Tuttle, OK on 4/11/2001. Sarah was found dressed, but her clothing was disarranged and the Medical Examiner advised she had been suffocated.